Artist Mario Pierre-Louis with "Obama", November, 2009. (Photograph © Anthony Hart Fisher 2009). 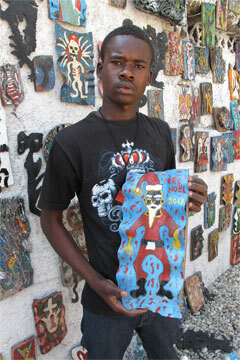 Four years later - Artist Mario Pierre-Louis with "Pere Noel", January, 2014. (Photograph © Anthony Hart Fisher 2014). Artist Wender Thelisma with sculpture, November, 2009. (Photograph © Anthony Hart Fisher 2009). "Timoun". 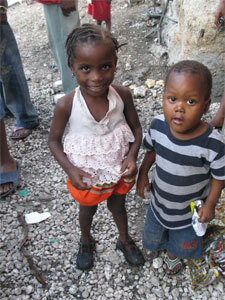 Two of the children of the Gran Rue, November, 2009. (Photograph © Anthony Hart Fisher 2009). "R.I.P. 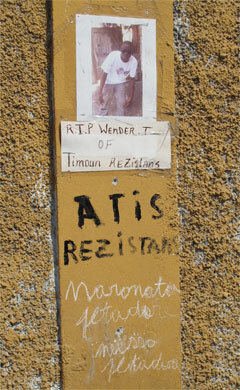 Wender T. of Timoun Rezistans" - Sign posted in the Timoun community, January, 2014. (Photograph © Anthony Hart Fisher 2014). Artist Evens with "Pere Noel", November, 2009. (Photograph © Anthony Hart Fisher 2009). 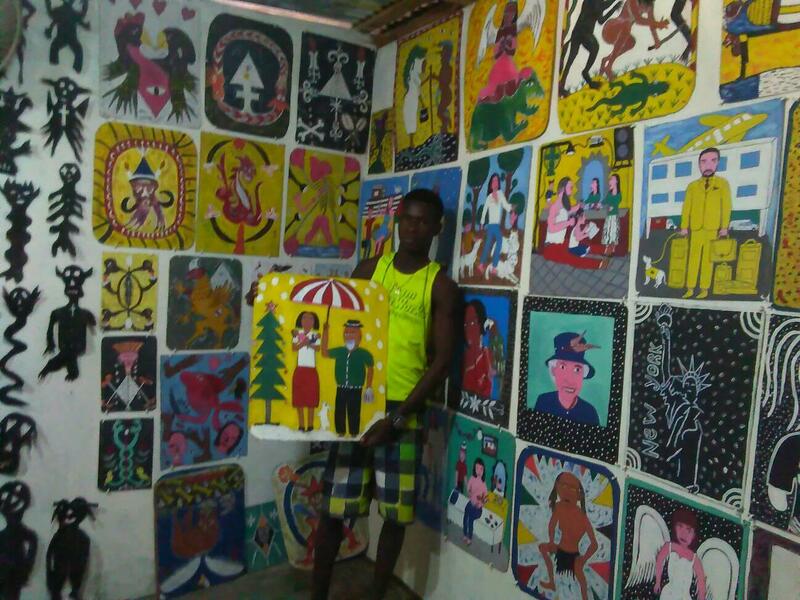 The "Timoun" are the junior members of the "Gran Rue" community of artists who live in the alleys and shanty towns off of the Grand Rue (officially the Boulevard Jean-Jacques Desallines), and make art out of "recycled materials" (otherwise known as trash). Originally the main shopping street of Port-au-Prince, the street was in an advanced state of decay when I visited in November 2009. The group, which goes by the name "Atis Rezistans" ("Artists of the Resistance") has exhibited internationally, and in December 2009 hosted an art event known as the Ghetto Bienniale 2009. The leading artists of this group are Andre Eugene, Jean Herard Celeur and Guyodo (Frantz Jacques). 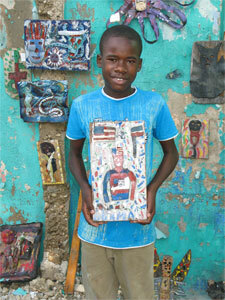 They operate informal outdoor art schools for the children of the neighborhood, who are known collectively as the "timoun" (Kreyol for children). One group calls itself the "Timoun Rezistans". 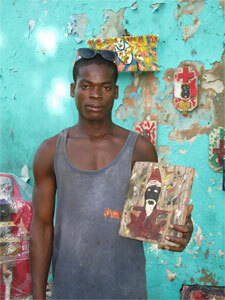 Another group, led by artist Guyodo, is known as "Timoun Klere". Two months later when "Goudou-Goudou", the great Haitian earthquake struck on January 12th, most of the buildings along the street were destroyed. 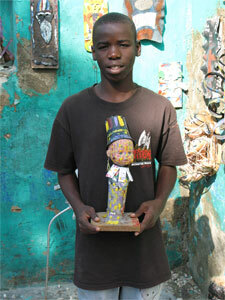 Louco, one of the adult artists in the community, died when the building he was in collapsed. One of the few mercies of this catastrophe was that most of the people in the shantytown survived the earthquake, since their shacks were mostly single-storey, and built of tin , wood and other relatively light materials. When I returned to visit the community in January, 2014, it had survived, grown and become something of an institution. There had been more "Ghetto Bienniale's" in 2011 and 2013. The artists have been featured in more international exhibits, flims, and museum shows such as the recent Kafou: Haiti, Art and Vodou at Nottingham Contemporary in the UK, and In Extremis: Death and Life in 21st Century Haitian Art, at UCLA's Fowler Museum. The timoun, of course, were now four years older. They have lived through the earthquake, have seen much more exposure for their artwork, and some have even been abroad for schooling and exhibitions. Several of the same kids, such as Mario Pierre-Louis, his brother Herold Pierre-Louis and Leonce Love were there, showing and selling their work. But one of the first signs I saw as I entered the community read, "R.I.P. Wender T. of Timoun Rezistans". I remembered Wender Thelisma, and his small doll-headed sculpture. In fact my photo of him (printed off this page) was even posted as part of his memorial. "What happened to Wender? ", I asked. "He got sick" was all I learned.